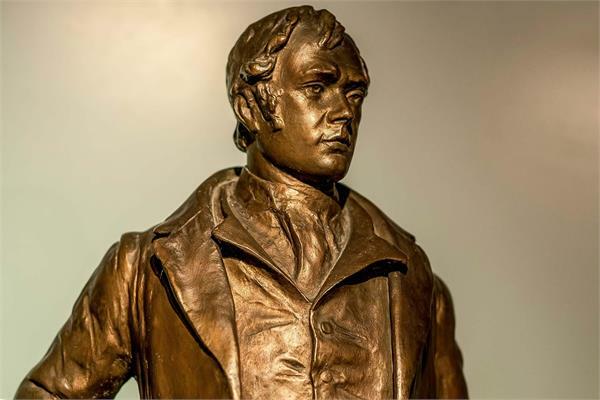 Across Scotland, as well as at numerous venues elsewhere in the UK and around the globe as far distant as China, Scotland’s national poet Robert Burns will this week be toasted at thousands of dinners and suppers held in his name. Burns’s association with Scotland, haggis, whisky and social congeniality is long- established. What though of the significance and meaningfulness today of this Burns-inspired merriment? In Scotland nationalists will claim him as their own, as the writer of the stirring patriotic song best known as ‘Scots Wha Hae’, with its evocation of ‘Freedom’s sword’ countering the ‘Chains and slaverie’ associated with England’s King Edward I. They will celebrate him too as the Scottish poet who captured in verse – much of it written in the Scots dialect – the essence of old Scotia. He will be saluted as the articulator of values sometimes assumed to be intrinsically Scottish – radical, democratic and humanitarian. But the other main political parties along with interest groups, community associations, masonic clubs, Burns and Rotary Clubs and many more besides, will also join the festivities. One way or other, mainly by judicious selection from his works (and in some cases much stretching of credibility), speakers will demonstrate that Burns was one of them too. This is perfectly legitimate, and nothing new. From the time of his death in Dumfries in 1796 the bones of Burns’ poetic legacy have been fought over. The first bite was taken by the Tories, keen to promote Burns’s poem ‘The Cotter’s Saturday Night’, a paean of praise for the humble lifestyle of the rural poor, their stoicism, and a model for others of similar rank to abide by. Alarmed at the prospect of revolutions of the kind that had rocked the ancien regime in France and elsewhere on mainland Europe, Burns’s first editors elided poems and sections of them that from an establishment perspective were toxic in their assertion of human dignity regardless of rank, title or wealth. They were unable however to hold back the tide and by the middle of the nineteenth century Burns’s song, ‘Is There for Honest Poverty’, better known as ‘A Man’s a Man’, had become a Radical anthem. It is difficult for us nowadays to appreciate the impact for labouring people, small shopkeepers and the like of lines such as ‘For a’ that, an’ a’ that,/Our toils obscure, an’ a’ that,/The rank is but the guinea’s stamp,/The man’s the gowd1gold for a’ that.’ Burns gave to people of this description a standing in the social order that even fifty years earlier would have been unthinkable. It was his distaste for monarchy, courts and governments that goes a long way in accounting for the early and enduring popularity of this song – and Burns – in the United States. At home Burns was also adopted by the manufacturing and commercial classes. He was heralded as an exemplar of how with hard work and the grace of God (the ‘heaven taught ploughman’) success and fame could be achieved. His proud independence further endeared him to Victorian liberals with their dislike of the state and the corrupt politics of the pre-democratic age. Heroic statues of Burns mushroomed not only in Scotland but also in the British empire and dominions, designed to convey just these messages. By the later Victorian era socialists had joined the ranks of Burns admirers, leading the way for the communists to commandeer Burns in the twentieth century. About one matter however there was no contest. One of the most extraordinary days in Scotland’s history was 25 January 1859, the centenary of Burns’ birth. Unprecedentedly, in virtually every city, town, village and hamlet work ceased and countless celebrations were held. As ever there were disputes, mainly over what Burns should be commemorated. However, as The Scotsman reminded its readers, the ‘chief characteristic of Burns was his Nationality...he was utterly and intensely, before and beyond everything, a Scotchman.’ Many believed that Burns had rescued Scotland from oblivion – above all through his work as a collector, adaptor and writer of Scottish song, the nation’s genetic code. Patriotic pride at this time was as intense as it has ever been. Yet for most Scots this sat entirely comfortably with their acceptance of the British Union. Burns himself could see some benefits in being British, and not just because in his later years he was employed as an agent of the British state as an exciseman. Nowhere did Burns call for an end to the Union even if he was contemptuous of the ‘parcel of rogues’ who had brought it about and could rage against Westminster’s disdain for the country he loved with a passion. Yet as the Revolution in France turned outwards, and the threat of an invasion of Britain mounted, Burns disavowed his earlier Jacobinism, and joined the loyalists - although with what degree of sincerity remains a matter of debate. While Burns was authentically Scottish and nourished through his verse and sentiments the Scots’ sense of distinctiveness as a nation, he was never a narrow nationalist. The values he represented, and through his verse espoused, transcended party, class and nationality. Above all – and this goes a long way towards explaining his world-wide appeal, he is a poet of humane-ness, who observed the failings of his fellow human beings. For these, usually gently, often humorously, he chastised. He rarely condemns. Just over a century ago – in the decades that preceded the First World War, as the nations of Europe became increasingly belligerent – Burns was marshalled in the cause of world peace. For Dunfermline-born Andrew Carnegie, the US steel and railroad baron, philanthropist and ardent peace campaigner, Burns was nothing less than a prophet of global harmony. Carnegie thought – hoped – that humankind, inspired by the final stanza of Burns’s ‘A Man’s a Man’, with its stirring climax, ‘For a’ that, and ‘a that,/It’s comin yet for a’ that,/’That man to man the world o’er,/Shall brothers be for a’ that.’, would turn its back on war. He was to be bitterly disappointed. Even so, there is still merit in Burns’s vision of a world without boundaries. Britain is deeply fissured over Brexit. Scotland is divided over independence. In the campaigns to break with the respective unions there is a xenophobic dimension, albeit at the margins. Much uglier chauvinism is emerging in other parts of Europe where right wing nationalist parties are gaining influence. Farther afield, not least in the USA there are distressing signs that outlooks are narrowing, with walls both material and virtual being erected, whether over trade or to stem migrant flows. Professor Chris Whatley is a Scottish historian who has worked at the Universities of Dundee and St Andrews. Best known for his work on Scottish economic and social history, more recently Chris has broadened his interests to include political and cultural history. His most recent book is Immortal Memory: Burns and the Scottish People (2016).